Reach out to the aging specialists with our geriatrics email list, which contains the physicians with a great deal of general medical knowledge who also meet the needs of the elderly population. 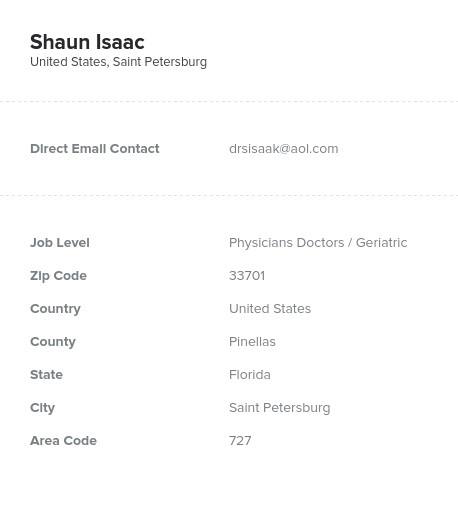 Buy the emails of geriatric and gerontology doctors and connect in minutes! Bookyourdata.com brings you qualified doctor lists of those in relevant specialties so that you can target your medical or pharmaceutical marketing campaign and reach a narrow audience. Find those rare doctors who work specifically with the elderly using our easy-to-use, ready-to-download email database of gerontologists and geriatric physicians. Grab the geriatric emails you need easily by downloading this list as a .CSV and then pulling it right into your sales CRM software. Once you have bought and opened it, you'll see huge assortment of information packed into our one doctor mailing list of geriatricians: email addresses, phone numbers, postal addresses, and even their fax numbers. If you have a pharmaceutical or medical product that can help in the care of the elderly, aid the doctors serving them by letting them know over the phone, with email, or with mail. Our geriatric and gerontology physician database is a great product when you're trying to promote a mobility aid like a wheelchair or an exercise program for the elderly, for instance. Once you have these powerful medical B2B contacts, you can email geriatric doctors offices and nursing homes, which can distribute your products to a wide group of aging individuals. Buy our list of geriatric emails, email leads who are influential physicians in a relevant space, and reach out to the growing aging population in a whole new way today.